Can I put Li-ion batteries in series and discharge them at different voltages? I need to run a pump (drawing 95mA at peak flowrate) at +14V and the rest of my circuit runs on +3.3V. To save on battery costs, I was thinking of purchasing four 18650s at 3.6V 3500mAh per cell and stacking them in series to produce ~14.4V needed for the pump (it can run between 10-15V and we are going to use PWM to control the voltage i.e. the flowrate). Could I also run two terminals from one cell (at 3.6V) and regulate that to 3.3V for my lower voltage loads? I understand that this will cause one of the four cells to discharge faster than the other three, but I plan on using a BQ29209 balancing chip to maximize the capacity I can get out of them. Would it be wiser to just use two buck converters from 14.4V down to 12V and 3.3V respectively? Ideally, if I had more money, I would put 4x 3.6V in series = 14.4V @ 3500mAh, and then another 2x 3.6V in parallel = 3.6V @ 7000mAh to get more capacity. Yes, that would be a MUCH better idea. Tapping off 3.6 V for making 3.3 V is a BAD idea as you would be using that single cell differently (loading it more) compared to the other cells. Then this cell's charge state will at some point be different from the other cells. Also if you charge the cells the other cells could be fully charged while that single cell isn't fully charged yet. You would need separate charging circuits to handle this properly. Also that single cell will wear out sooner than the other cells. Using a buck converter to make 3.3 V from the 14.4 V is easy and much better design wise as all cells will be treated equally. As @Bimpelrekkie already mentioned, the buck converter is easy and relatively cheap (I assume you do not need any high currents there) to implement and much better idea from almost any point of view. Balancing with BQ29209 means, that you are simply putting a resistor in series with higher-voltage cell. It means that you other cells are discharged with the same current as the first one, but energy is lost in joule heat. It is in no way "... to maximize the capacity I can get out of them" Besides, I am not sure you can easily adapt BQ29209 to balance 4 cells in series. Your proposed design is flawed, consider either step up or down. I give the considerations for each. 3.3V Buck converter for 1mA to 0.1A is much simpler than a Boost regulator in component count. 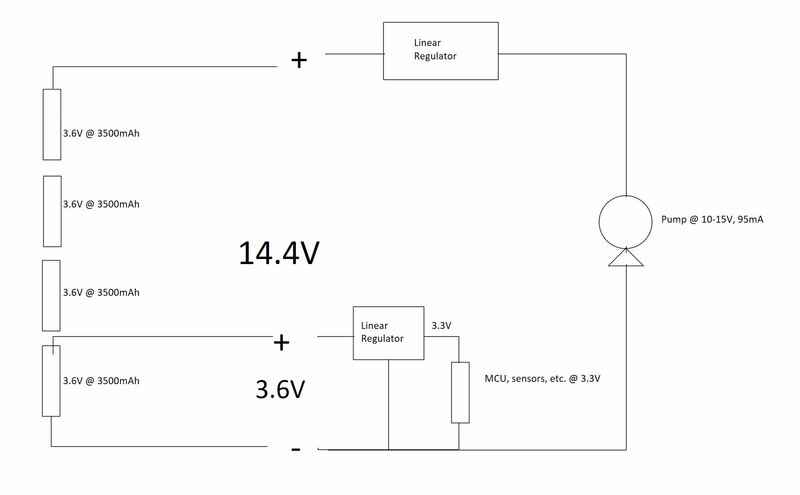 14.4V Boost converter is better regulated than a 4S = 12 to 16V pack and delivers constant energy when needed and may be disabled when not for high efficiency. Both Buck and Boost in this range will be about 85% efficient but the Boost can be disabled when not needed. a 3v~4V 4P pack with a buck-boost converter for 3.3V can extend the capacity of the pack unless you use an 3.0V ultra low dropout LDO . only you can calculate this and use in your design spec for efficiency, energy storage, discharge time, complexity and cost. start with a better design spec. Not the answer you're looking for? Browse other questions tagged batteries lithium-ion discharge or ask your own question. How can a used alkaline cell rate at 1.9 volts?